On our last visit to Quebec City, we went ahead of the group we were traveling with to experience the Auberge Saint-Antoine. Both being interested in history, we had walked by this property in the late 90s, took part in a site inspection in 2010 and were convinced we needed to discover more this past year. Auberge Saint-Antoine is part of the prestigious Relaix & Chateaux group. Guests may or may not know that all of its properties must have a story. Well, this hotel has a soul and guests are aware of it throughout the entire property. These awards confirmed what we already thought, but nice to know we were right on target in our evaluation. 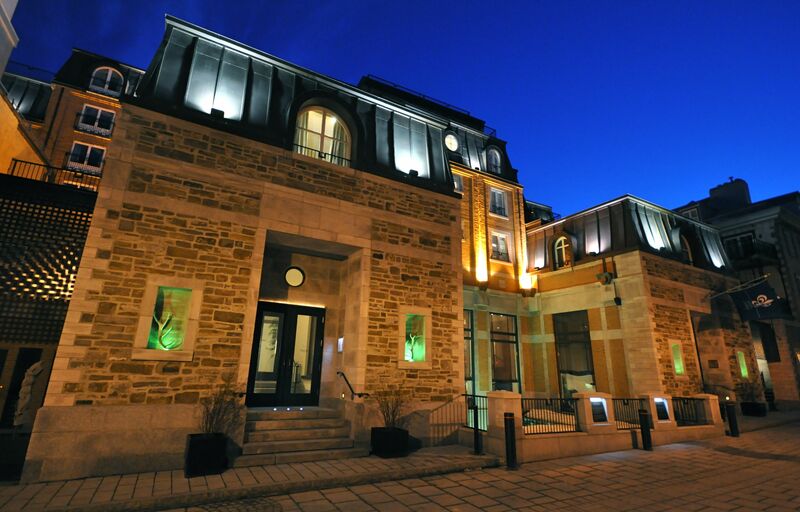 Today, the hotel is located in the oldest part of the city, close to the St. Lawrence River in the heart of Quebec City’s Old Port. In 1687, the French king awarded waterfront lots to two prosperous fur merchants. By 1704, they had built two wharves on their properties. In 1725, a prominent mason built his house nearby, next to the Dauphine Battery, needed for defense. In 1763, the Seven Years War ended and possession of Quebec province passed to England. Two Englishmen bought the above war-damaged house and arranged for another wharf to be constructed. In the next century, a long dock made it feasible to handle larger ships and so a huge warehouse was built. Initially, wine and other products were traded there, but then the warehouse turned into a dish and glassware importer. As a result, broken pottery and china were recovered from damaged goods arriving. A hotel on the grounds was started in 1895, at a cost of about $150,000. An addition in 1926 included rooms with separate bathrooms. This small local hotel operated with 23 rooms. In the early 1990s, the Price family gained control of the building. They had been prominent in Quebec province since 1810, with wealth originating in pine forestry, sawmills, then pulp and paper. In 1988, archeological digs were started on the Price property, lasting ten years. A veritable treasure trove of artifacts was found, stemming from centuries of warehouse use. Around 5,000 pieces have been found so far. Four years later, in 1992, the Price family opened up a new hotel, by expanding and renovating the old hotel. Immediately adjoining the establishment, 64 additional rooms were opened, along with 12 new suites. Six of these suites were added in 1996, by integrating them into the 18th century Hunt House. Today, total room capacity is 83 regular category and 12 suites. Renovation of the hotel had three phases. In 2003, the final addition of hotel rooms was completed. The most innovative part of the project was combining these recovered artifacts into the hotel’s decor. Artifacts featured throughout the hotel cover four centuries of Quebec’s history. Today, 700 of the uncovered historical treasures are displayed in throughout the hotel and outside of guest rooms. In its lobby, vitrines and three miniatures are used to show off selected artifacts. When guests walk in and look at the miniature port during different time periods, each of the three areas lights up and history comes to life. We particularly liked how many of the valuable artifacts were displayed in glass blocks within the walls. Visitors can see them clearly, but they will not be damaged. The bar and the front desk are made from recycled wood from the old dock and the soft patina is welcoming. Outside each room door, there is a glass block with an artifact, and by the bedside is an explanation of artifact and its use. One of the rooms we saw had a domino. It shows how long that game has been popular. Andre-Eusebe Vaillerand, Importer and tableware and lighting merchant. Starting in 1993, the architectural firm, Jean Cote & associes, has been intimately involved with Saint—Antoine’s design. Their designs have been used in development of the Panache Restaurant and the Auditorium, a uniquely styled amphitheater in a hotel. The Panache, one of two Saint—Antoine restaurants, opened in 2004. 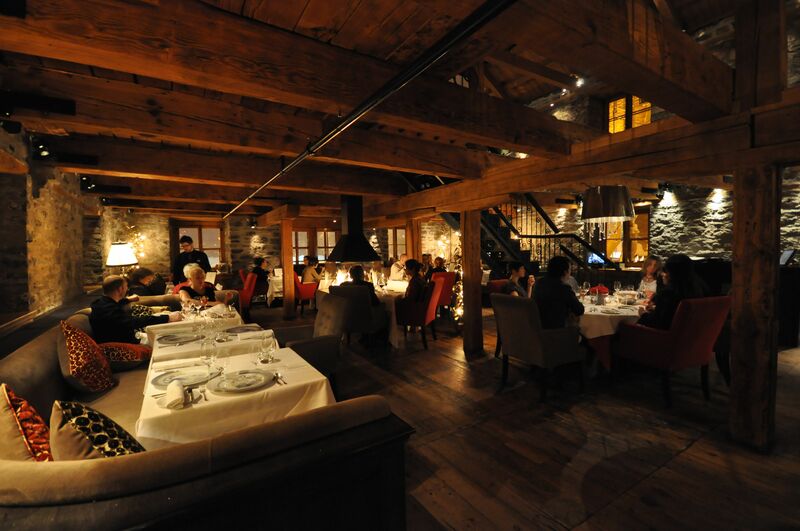 Its menu features traditional French Canadian cuisine with a modern twist. 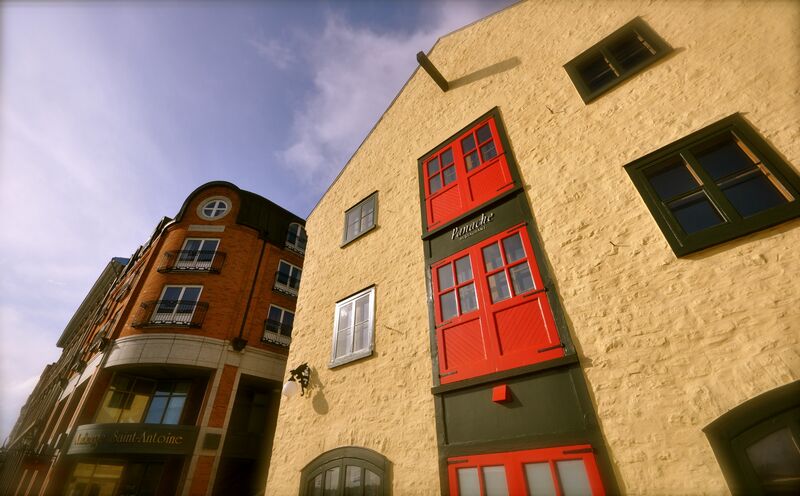 Panache’s stonewalls were originally part of a riverside warehouse. The china used is a replica of three-quarters of a plate that was found. During our exploration, we were fortunate to experience Panache for lunch and the next evening for dinner with a group. It was especially nice, as the first one was intimate and the other let us experience a group service in private dining room. One of the photos displayed on the wall shows all of those who worked on recovering the artifacts. Last year, they had a reunion to enjoy and see the fruits of their labor. In discussing all that is old about Auberge Saint-Antoine, we did not emphasize how much care has been taken with modern day comforts and luxury. These extend to luxurious linens, goose down duvet and pillows, Noir products, Bose sound system and just about anything guests could desire. The hotel’s world-class spa was inviting us in, but time constraints kept us away. Maybe next time. It also has a signature gym and health zone. The focus of the two is an energy-efficient area for restoring mind and body wellness. Close to the hotel, on the Price family property, the Musee du Fort presents a sound and light show about Quebec City’s military history. Started in 1964, the Musee presents a scaled model of the city, to highlight its presentation. 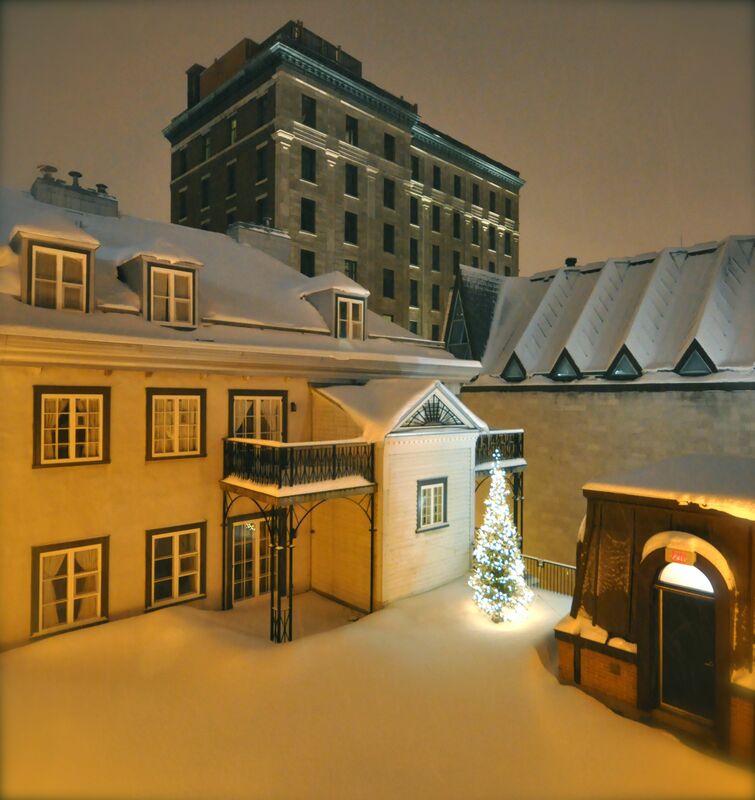 In summary, Auberge Saint—Antoine provides luxury hotel accommodations, combined with four centuries of rich Quebec history. Who could ask for more? Photographs are courtesy of Auberge Saint-Antoine. To read the Luxe Beat Magazine version of this article click on the title Auberge Saint-Antoine—A Fusion of Great History In Quebec City.